I’m tired, my muscles are sore and I’m dehydrated, but that’s a worthwhile price to pay for doing the route Will and I did yesterday. On Wednesday evening Will and I headed up to Aviemore to stay the night in James’ parent’s house on the outskirts of the town. We where planning an early start on Thursday morning so it was nicer to stay in a house then to kip in the back of my car in the Cairngorm car park. Once at James’, we sorted out our gear and tried to match our intended route description to some guidebook photos and other routes info. When we left from my house to drive to Aviemore, our plan was to head over to the Shelterstone for a bit of a recce mission and maybe try an easier line up the face to familiarise ourselves with the crag as neither Will nor I had climbed there before. But earlier that day I had been speaking to Guy about his and Macphersons’ route “Stone Temple Pilots” and had asked him for the route description for later in the season. As we were driving North, Will and I were discussing routes on the Shelterstone and “Stone Temple Pilots” came up in convocation. Wills’ next comment was “Should we just do that tomorrow instead?” and my reply “YEAH BOI!!!! And the plan was made. So we set our alarms for 2am and headed to bed filled with anticipation and thoughts about the following days challenges and delights. As is often the case with early starts, it seemed to come around way too quickly and before I knew it I was walking away from my car and off in the direction of Coire an Sneachda on the way to the Shelterstone. We reached the bottom of the route in total darkness, apart from the odd shooting star that zoomed overhead in the clear night’s sky. 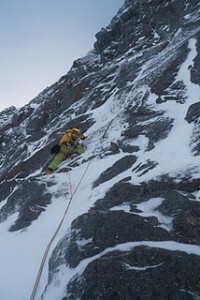 After sorting gear and ropes, I headed off up the first long pitch of the “Steeple”. This pitch was home to some techy and thin climbing that was time consuming due to all the snow and cruddy ice on the slab and in the cracks. 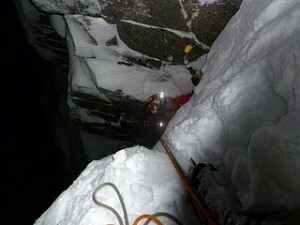 But I managed to make fairly good time and I was at the belay and bringing Will up the pitch by the time it got light. The next pitch seemed to go ok and Will made short work of the short nippy section at the end of the second corner. 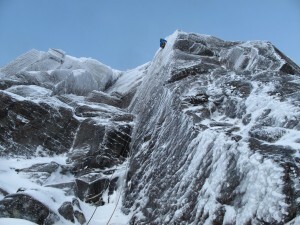 I swiftly seconded that pitch and ran up the next short pitch to the base of the steep and sustained crux. This is where the route really started to show its true colours and I got put through my paces as I fought my way up the sustained and tricky fractured wall. From below I thought the pitch looked ok and not that steep. But as I started up, the pick placements were good and the moves were big and fun, but then the angle started to really kick back and I found myself getting pumped on overhanging technical sections that felt super hard. To be honest, I made it to the belay only by the skin of my teeth. 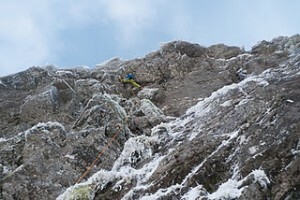 I thought the pitch was hard, super steep and technical which would be worthy of grade IX/9 in its own right! Which usually would be fine, but knowing we still had 4 hard pitches above this really started to play on my mind as I belayed Will up the next shorter techy slab pitch. After Wills pitch he belayed on a big turfy ledge that we joked about biviing on to try and get some rest as the route was starting to take its toll. Above the left end of the ledge was a nails looking crack which looked steep and energy sapping. I started up the crack with every move making my arms cramp up. After a bit of route finding issues to where we needed to swing round the arête, I soon made the long reach into the big crack and up onto the easier ground to what I thought was the big terrace below the next pitch. As I was bringing Will up the pitch I realised that I had belayed in completely the wrong place and from where I was it was going to be very hard to gain the proper belay. So I shouted to Will to take out my last runner, which thankfully was 10m below me, then head right up the turfy groove to reach the correct terrace and belay as for the route. Once he had done this it was getting dark, so I headed back down to where he had climbed the groove and ascended this to meet him. Unfortunately this took a bit of faffing around and by the time I had reached Will on the correct belay it was totally dark and the starry sky was again in full view. Thankfully we had expected to start and finish the route in the dark, so we fired up the head torches and Will got stuck into the next pitch. 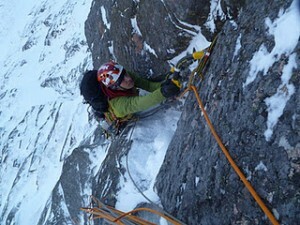 This pitch was also very sustained with a spicy crux section and some blind hooks to gain a small pod. After this there were some techy sections into a steep and awkward finish out of a capped groove. Once Will had shouted safe I stuffed the packet of Haribo that I had been munching on to try and get something from the sugary goodness, back into the bag and shout to Will how hard did the next pitch look. He replied with “It looks good” which I took as code for HARD! But I set off seconding his pitch anyway and tried not to think about what was ahead until I got there. I reached the belay and as soon as I looked up my biceps started to cry. “Mate, it looks nails” was my first comment, but we exchanged the rack and I moved up to the base of the last steep wall of this mega route. After starting up the shattered wall I thought that the hooks where good until I moved right into the baggy crack that needed to be climbed to gain the snowy ledge above. I climbed the crack, but couldn’t find a way to get onto the big ledge. Due to the huge mass of snow on the ledge, no ice had formed and there was no turf to be seen to get an axe to stick in to mantle onto the shelf. After some failed attempts to gain any height I shouted for will to “watch me” and threw my right foot above my axe and proceeded to push down my tool to try and rock onto the ledge. This didn’t really work and as soon as I got my foot up I was totally off balance and slowly falling backwards. In a flurry of panic I punched into the deep snow with my right fist and tried to use it to help me rock over. The first time it just pulled through, but as I was now pretty much about to fall I gave it one last punch and threw my body forwards. Much to my surprise I then found myself lying in the deep snow on the ledge, it had worked. I stood up and swiftly climbed the steep but very enjoyable corner which leads to a big terrace. I could now see the summit and there was only about another meters 10 of climbing to go before we had cracked this long and tiring route. Thankfully the last overhanging corner was fairly straightforward compared to the previous section and a few minutes later I was standing on the top of the Shelterstone. Whilst belaying Will up, I couldn’t stop my hands and forearms from going into awful cramps. But even though the cramps where painful and I was completely exhausted, I looked around at the moon beaming down over Loch Avon and the numerous shooting stars flying through the sky. There was nowhere else I would rather have been at that point! What a way to end an awesome day on an even more awesome route. Ok….since my return from the Ben at the weekend I’ve been chomping at the bit to get out in the hills again. I texted Will on Sunday to see if he was free for some crankage on Monday, but he said he had to work. So it was a mass text session to everyone who climbs in my phonebook to see if they where free and psyched to get out the following day. 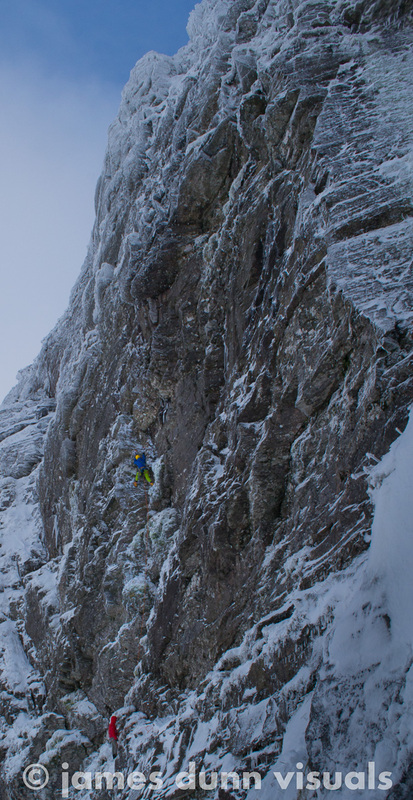 Thankfully Guy Robertson got back to me saying that he and Pete MacPherson were planning on heading into Coire an Lochain to look at a new line that they’d spotted last week and were cool with me tagging along; so the plan was made. 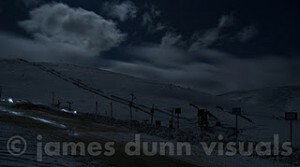 I headed up to the Cairngorm mountain car park late on Sunday night ready for an early-ish start yesterday morning. 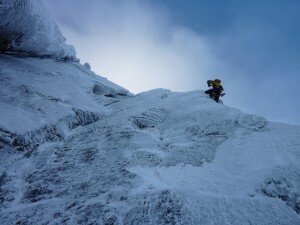 We set off towards the coire under a fairly clear sky with little wind and 3 lots of winter psyche charged and ready to get a new route sent and put to bed! When we reached the bottom of the buttresses it was obvious that everything in the coire was in awesome, if not a bit buried, condition. So it was game on! 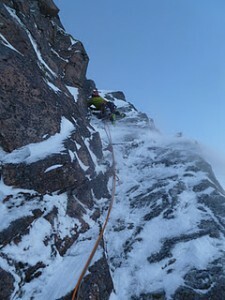 We headed off to the base of the classic route of the coire “The Vicar” where our intended line was going to start. Guy set off up the first pitch which took a direct cracked wall straight up the deceptively steep face to the belay ledge of “The Vicar”. This was a 3 star pitch with every move better than the last. Although the hooks and gear where good, the pitch was pretty pumpy and definitely got the blood flowing. Pete swiftly seconded the pitch, with me hot on his heels. We reached the fairly cramped but comfy belay ledge in good time and quickly sorted the ropes and gear so that Pete could get stuck into the very meaty looking second pitch. Pete set off up the pitch with some very bold and hard looking moves straight off the belay. All I could think about as he was leading off was “I’m so glad I’m going to be seconding this pitch with a nice safe rope above my head”, but Pete showed his experience and pushed on to gain the thin and super technical slab that barred the way to the huge roof. He was out of view at this point behind the arête so Guy and I could not see him, but his comments of “WATCH ME” and “I’M HOOKING NOTHING HERE GUYS” told us all we needed to know! But before too long Pete appeared bellow the gnarly looking roof where he tried to get some recovery and gear before he decided to give it his all; which is exactly what he did! He charged up the overhanging flake/crack that was forming the left side of the roof and after some wild axe swings and impressive foot placement changes he was now well above his last piece of gear. One of his axes ripped from the crack but he just powered through with his other arm, unfortunately as he was swinging his free tool to get another placement, the other tool ripped and before I knew it the rope in my belay device was getting ripped tight and Pete was at the end of an impressive 11m fall straight onto the slab. Guy and I were stunned, although he was still on the steep ground, he was so close to getting over the roof. Pete said he was ok, shook it off and jumped straight back into action for round two with the beast. He gained the roof above the gear again but this time, and understandably, his head was a bit spangled after the big fall and the pump was still raging through arms after his previous fight with the crux. This was fair enough because if I’d taken that fall, I don’t think I would have even had it in me to attempt to give it a second go let alone climb passed the gear for a second time. So the decision was made. After an awesome effort from Pete, he lowered back to the belay, pulled the ropes and I tied into the sharp end to go for another round with the intimidating line. All my lovely thoughts of having a nice safe top-rope up the bold and hard looking pitch were soon blown away, and I found myself shivering with anticipation before stepping off the belay ledge straight into the jaws of the Tiger! I also found the first moves super bold and thin and was thankful to get my feet on the slopey foot ledge below the typical Cairngorm granite slab. I moved up the slab and realised why Pete had made the comments he had. There were sections were I was literally hooking less than half a centimetre of granite/dirt and the gear was defiantly not worth falling on at this point. I persevered and found myself situated under the roof in the position where Pete had tried to recover. All I did was get more pumped! At this point all I could think about was the fall that I had just witnessed. I looked up to see if I would be able to get some higher gear before committing to the steep moves. I climbed up and tried to place a small nut, but now that I was on the steep ground my energy was starting to drain and every time I placed the nut it would just rip out. By now I was super pumped, so I clipped the nut and shoved in back in, gave it a very light tug and told myself it was bomber (it was totally useless, as it fell out once I was above it). I tried to get psyched but as I peered over at the roof I couldn’t see any way of progressing if I was to commit through the crux. There was an obvious good foot ledge on the lip of the roof which was the start of a second bold looking steeper slab, but above that was a huge overhanging totally featureless wall. This is the downside to trying new routes, you never know if the line is climbable or even if there will be any gear to lower off if you can’t find a way to proceed! But that’s why we do it, for the ADVENTURE! I fought the demons in my head and decided to man up and give it a shot. I looked down and thought I really didn’t want to hit that slab from any higher than where Pete had got. I gave out the obligatory psyche shout and got stuck in. I made some big steep locks and swung to try and get my axes to stick, my left tool kept ripping but as my arms where losing power my pick caught on something miniscule inside the crack, not wanting to try again in case it ripped, I matched the tool and swung my right foot onto the ledge that was at shoulder height. At this point I was above Pete’s high point and knew that a fall would probably result in a helicopter ride! I scraped with my left frontpoint and got it to stick on something out of view, I shouted “WATCH ME” and the calls of encouragement were a blur behind the thumping fear and desperation in my head. Somehow, a second later, I found myself standing on the tiny rounded foot ledge, and the feeling of success was flooding through me. After regaining my breathing I focussed all me attention on finding some much needed protection. As I was now what felt like miles above the piece that was situated on the slab under the roof. I looked around and the first thought that came into my head was “what a stupid idea that was”. I was now stood dangerously far from my last useful runner and there were no hooks, gear or an obvious way of progression to be seen. I scraped at what looked like cracks under the snow on the slab, but these turned out to be the usual Cairngorm useless fooking seams! I eventually found a collection of hideous looking protection and forced myself to continue to what looked like a good gear placement on the far right of the slab and what appeared to be the only way to gain the easier ground higher up the buttress. I balanced my way across the terrifyingly technical and tenuous slab, where at points I had no hooks and both feet were on tiny rounded smears on the boldest section. It felt like the Hurting all over again, but unlike when I climbed the Hurting, we did not know if this line/route was even climbable, as no one had ever been on it (the joys of ground up/onsighting). After some shouts from Guy and Pete to see how I was doing, I replied with “I’m nearly at the easier ground” and then with one long span I reached the good gear and much better hooks that I had set my focus on for the time I had spent on the scary slab. After a couple of techy moves, this time with bomber gear, I reached the much easier ground and charged up the last 10m to the belay. After bringing Guy and Pete up the pitch, I was pleased to see the big beaming smiles on their faces. Even though we were all tired, drained and the route had made us give it our all, there was still a huge amount of enjoyment in the climbing and I personally was super pleased to get up the route clean. And yet again the Northern Coires deliver another amazing line. From what I’ve done in Lochain and having climbed most of the hard routes at this venue including the highest graded lines, this was by far the most serious and the hardest line I had done there! 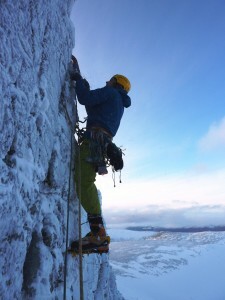 Guy commented that the route was comparable to “Crazy Sorrow” which is a grade IX/10 in Lochnagar that he did last season. So it was a good addition to this awesome and super accessible venue. Hopefully there will be many more! 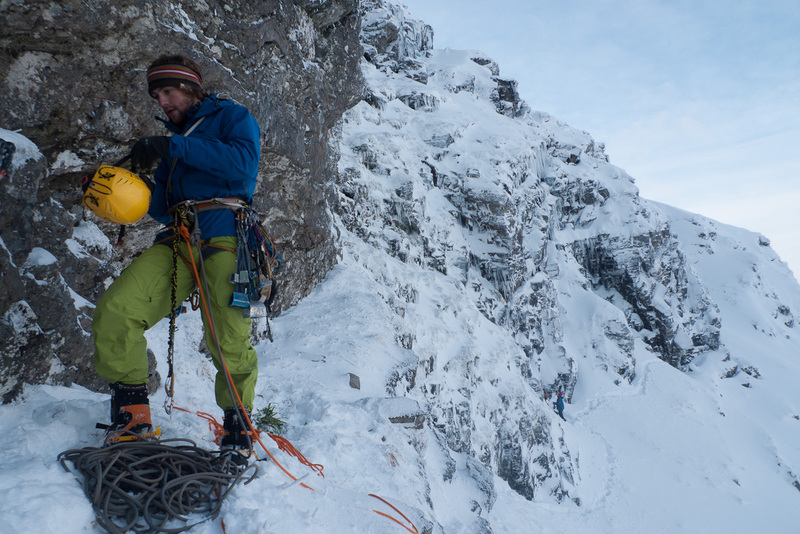 We called the route “Siberian Tiger” *** and gave it the hard grade of IX/10. A bit windy in them hills! Ok so winter has arrived, and what a start it was been. Last Friday morning I headed off to Simon Yearsley’s house bright and early to meet up with him and head off towards Fort William for the STS on the Ben meet (sponsored by Big Tree campervans) that was being held at the CIC hut on Ben Nevis. The meet was for the STS competition winners and special guests, and I was asked to be one of the hosts for the weekend. Despite the awful weather forecast we managed to get some good routes done with good weather and everyone seemed to have a fun time. On the Friday afternoon I teamed up with James Higgins for a route on the Douglas Boulder, we did “Gutlass” which is a fun little IV/5. We climbed this route in conjunction with Malcolm Bass and Harry Holmes who were also on the meet. On the Saturday I paired up with Fiona Murray and photographer James Dunn for the day. We headed off towards South Trident Buttress to see what was looking good. We opted for the route “The Minge” which is a line that follows a series of steep cracks that cut through the lower section of the buttress. 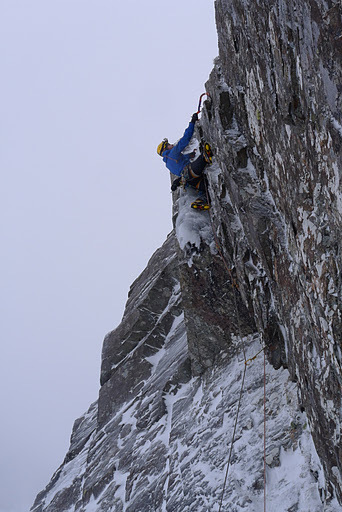 We made the second winter ascent of this VII/8 which was put up by Pete Macpherson and Ed Edwards back in 2009. After a good day on the Saturday, we woke up to amazing clear skies on the Sunday and the whole North Face of the Ben as our playground for the day. Again, we headed up towards South Trident area with a couple of routes in mind, but whilst trudging up the hill I spotted a funky looking ice dagger hanging from a roof on Moonlight Gully Buttress. I quickly picked out a continuation line above the dagger and asked Harry and James Higgins if the where keen for trying a new line. They both said they were up for it, so it was off to the bottom of Moonlight full of anticipation. After a bit of battling through the roof to gain the ice, I eventually (second try) managed to get situated in the groove and found a fairly restful position which I milked before heading boldly up the thin ices to the belay platform. Unfortunately on my first attempt to get sorted in the groove both my axes ripped out of the thin ice and I found myself hanging from the rope above the starting slab. But I lowered down and got it sent on my second go. Even though it was not a super long route and despite the tricky last pitch, it was not very sustained. But the crux was hard and bold, so I opted for the grade of VIII/8**, this might vary depending on the conditions of the ice in the groove. All in all it was a really good weekend with the STS group and it was good to see how well all the folk who are psyched for the tooling series got on in mountains. On the Sunday night after the weekend on the Ben, I chatted to a mate Will Sim who lives down south in St. Bees. I told him the conditions in the mountains were good and without hesitation he arrived eager and ready at my front door on the Monday afternoon. We planned on heading back up the Ben to the CIC Hut for a couple of days, but decided to take a detour en-route to have a look at the well known IX/9 “Defenders of the Faith” on Beinn Dorain which was put up by Dave MacLeod and Fiona Murray in 2006. 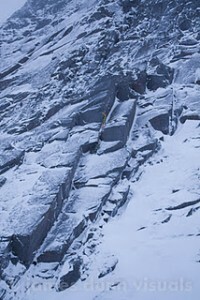 The route was originally climbed onsight, and was yet to see a second ascent. So off we went. James Dunn, Will and I met up with Adam Russell in the very snowy Bridge of Orchy train station car park and from what we could see of the crag from there, it was looking very white! 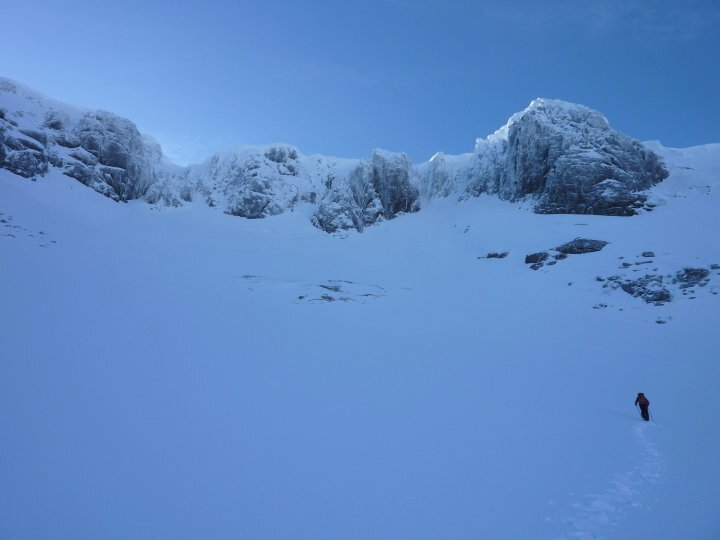 Filled with new hopes of finding our intended route in condition, and with the amazing blue skies and sunrise above us, we quickly pounded through the deep fresh snow up the base of the coire which gave us a full view of the line. 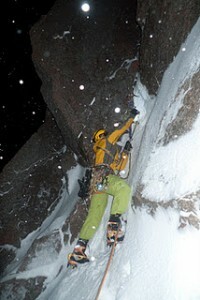 After picking out where the route went from the ground Will and I geared up and soloed up to the base of the crux pitch. I set off leading up the pitch and swiftly realised that it was steeper than It looked from below. But I pushed on and after some inventive gear placements and some even more inventive axe placements, I eventually arrived beneath the crux roof at the semi rest position. I looked around and tried a couple of different moves to try and breach the roof to gain the headwall, but nothing seemed to show itself. So after a bit of dithering around I decided that the gung-ho approach would be best and blasted over in full throttle. Once on the headwall I felt a little exposed and the thought that my gear was now well below me beneath the roof was fresh in my mind. I found some super thin hooks and a sketchy kneebar which was good enough for me to find some gear, after getting some protection the good hooks showed themselves and I was then comfortable and in balance on the face.